The Historical Society of Oak Creek & Phippsburg is honored to have the support of so many historically conscious visitors. We want to let you know that your membership and support is needed and appreciated, and involvement at whatever level you choose – regardless of your geographical location – will last for generations. 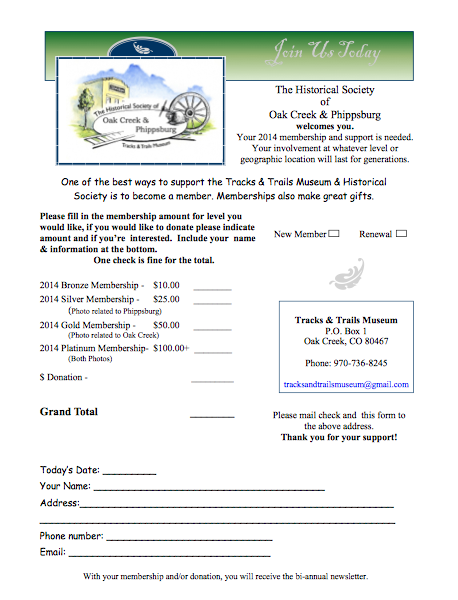 One of the best ways to support the Tracks & Trails Museum & Historical Society is to become a member – it also includes the added benefit of holding voting rights at meetings. Additionally, memberships make great gifts! Please click the thumbnail to download our membership form, and either return it to our physical address at 129 East Main Street in Oak Creek, or mail it to P.O. Box 1, Oak Creek, CO 80467. Thank you again and we look forward to seeing you soon!